With spacious and professionally designed cabins and a hospitable team of staff, Glory Cruise is ready to make your dream holiday come true. As you take your adventure to the World Heritage Site of Halong Bay, indulge in the deluxe cruise service. Cruise trip lasts for 2-3 days with option to extend available for charter cruise. Cruise amenities include luxurious guest cabins with central air conditioning, well-equipped bathrooms, dining rooms and bars, conference facilities, sports and entertainment equipments. Glory Cruise, with its beautiful design and deco style, accommodates 11 deluxe cabins, 6 suites with 4 combinable deluxe rooms to make family cabins. The large sundeck allows sunbathing as you appreciate the bay's gorgeous beauty. Glory is often recommended for its comfortable bed, quality cruise program, brilliant service on board and especially surpreme food served. 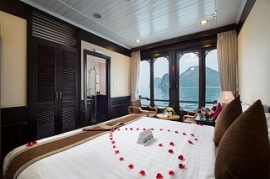 Glory Cruise without doubt is one of the best value cruise for your trip to Halong Bay. Meet up with our tour guide at your hotel in Hanoi at 8:00AM then enjoy the drive to Halong City. En route, capture beautiful sceneries of Vietnam with lush green paddy fields, romantic rivers and grandiose mountains. Reach Tuan Chau Wharf at noon and transfer to the vessel. After listening to safety instruction and rom check-in, come back to the dining room for tasty Vietnamese lunch while the ship is sailing deeper into the Bay. The first destination of the journey is Tung Sau area, where you may learn about the process of making pearls or do kayaking to explore the area. We later move to Titop beach for swimming (weather permits). Return to the vessel, take a bath and refreshment. The dinner is ready by 7:00PM with Vietnamese and International Set dinner menu. For the rest of the night, you may either have a refined drink at the onboard bar or take part in team building activities with your family or friends. If weather allows, you can join in our exciting squid fishing time. Overnight and anchor in Luom Bo area. Get up early to catch the first light of the sun rising over the bay and take part in Tai Chi class on the sundeck. After charging yourself full of energy with the light breakfast, our cruise continues to Sung Sot (Surprise) Cave, which is the most beautiful and primitive cave of Halong. Spend approximately 1 hour there before returning to the vessel for packing up. Enjoy the farewell party while the ship is moving back to Halong. Arrive at the pier by noon and get on our bus for the way back to Hanoi. On the way back, stop at at a local rest-stop. Taking some souvenirs for your family and friends then continue the bus ride. Arrive in Hanoi at 4:30PM. Tour ends. Children less than 5 years of age are FOC, sharing a room with parent/s. Hi, after the trip, are you able to provide a transport to Ninh Binh? can you pick me up at Hanoian Elite Home Hotel 35 Hang Ga ,Hoan Kiem Hanoi in 19 Jan? Is lunch served on the 2nd day in the 2D1N itinerary? Dear Mr. Vikas Kundalpady, Thank you for contacting us with your question! There will be brunch served on second day of the 2 day 1 nigh trip, preceded by light breakfast in early morning. The brunch will be held after you check out your cabin. If you have any other question please let me know! I would like to make a booking for 2d1n. Will be staying in Bat Su Street, Hoan Kiem District. May I know how to arrange the Shuttle pick up from my hotel? Hi do you collect from the Pullman in Hanoi? Hi, After the cruise we plan to get the night train from Hanoi to Hue, can you drop us off at the railway station? Also what time will we be back in Hanoi? I would like to book for two adults and three children but the website will only allow me to select two children. Hi, I would like to confirm that the free shuttle can pick us up at the Hanoi Space Hotel. Thanks! Hi, I want to book for next Saturday night (1 night) but i have a flight on Sunday night at 7pm. Is it possible to get a transfer to the airport instead of Hanoi city on return? Also is pick up from the old part of town ok? Hi, i'd like to start tour from Ha long city, It means that i dont need any shuttle bus from Ha Noi. If in this case, Can i get a discount for not getting ride of the bus? Do you pick up from Blue Hanoi Inn Legend Hotel as well? Hi can I check if free shuttle bus service available from Hanoi Diamond King Hotel on 1st march 2018? Dear Mr. Indah, Thank you very much for your question! I confirm that our offer of free shuttle bus still available on 1st March 2018. We can pick up from Diamond King Hotel for sure. Have a good day! I would like to ask if free shuttle and free kayak is still available on if we book for 21st Jan 2018. At the moment no bookings made. Also, if there is a free shuttle, possible to pick up from Hanoi old town hotel on 21st Jan,, but drop off at Hanoi holiday diamond on 22nd Jan. Thank you. Hi can I check if free shuttle bus service available from Hanoi Graceful Hotel on 20th dec 2017? Hi, would like to confirm if the free shuttle bus service still valid? I am checking if pick up available at Hanoi Royal Palace Hotel 2. Hi, I would like to confirm that the free shuttle can pick us up at the Silk Path Boutique Hotel. Thanks! Hi, Does the pickup from Hanoi include Authentic Hanoi Hotel? Is it possible to be picked up from Hai Phong airport with a 10:40 am arrival time to Hai Phong? Hi I'm interested to join the cruise. From the page my understanding that shuttle from Hanoi is included. May I know at which area I have to stay, and what time will the guess be picked up? How many beds are in the family deluxe room. I am looking for a cruise for a group of 3 adults. We would like to have separate beds. thank-you. Hi, we are considering the 3 day tour from this Tuesday (5th Sep). Can we please get a pick up from our hanoi hotel and then at the end get dropped off at Hanoi airport? Thank you. Hello I will be taking the glory legend cruise I wil be staying at the hanoi focus hotel, would you be able to pick me up or do I have to meet you somplace? My hotel is Hanoi La Selva Hotel. Can I use pic-up service at my hotel? or should I go to so other hotel that's near the lake? Hi, I wonder if you can offer pick-up service at my hotel which name is THE RAPIS HOTEL. Please Let me know, Thank you. LAPIS HOTEL is just name of where I booked. The address of it is 21 Tran Hung Dao Str, Hoan Kiem Dist, Hanoi. May I get a pick up service? Hi, we will stay at 36 Le Duc Tho Street,Hanoi, Vietnam,10000(Crown Plaza). Is it possible to pick us up and drop off at our hotel? and is it free service?? Dear Sir/ Madam, Thank you for your question. Glory Legend has a total of 17 cabins. Kayaking is included on the first day of the trip and will be held at Luon Cave area. The walking tour can be booked before or after your cruise trip and it is total up to you to decide. If you have any other questions please let us know! I saw that you offer free shuttle bus. So let me check the service is available. I booked my hotel 'Hanoi Emerald Waters Hotel & Spa' in '47 Lo Su, Hoan Kiem District, Hanoi, Vietnam 10000'. Is it possible to use the service?? Thank you. do you have air conditioned on this cruise? Hi do you do vegan meals? Hello. I have a group of 7 adults. We planned to have 3 rooms with two adults in each. Can we get an additional bed in one of those rooms to accommodate the 7th? Hi, 1) Do you pick up free from Golden Moon Suite Hotel? 2) How is the free Hanoi walking tour going to be arranged after the cruise when we come back and where will we be taken to? 3) Are bottled water given for each day? 4) Any squid fishing with equipment provided and included in the cabin fees? Thank you. Dear Kemmy, Thank you so much for your email and please kindly find my comments as below: 1- We offer free of charge shuttle bus transfer with pick up and see off within Hanoi Center/ Hanoi Old Quarter area. 2 - About our walking tour, it may be too late for you to join the tour after return from Halong Bay trip as we only can arrange morning tour at 08.00Am and afternoon tour at 02.00PM. Our walking tour start at our office at 72 Hang Trong street. 3- We only offer 01 bottle of water per person for 2days 1night inside your cabin for the cruise trip. For the other drinks, you can buy and pay directly on board. 4- Squid fishing offer free of charge. Thank you! I'd like to reserve a room for 4 adult(Family). And I saw that there is 2 options, 2 deluxe rooms or family deluxe (4 pax) room. Both rooms look good. but I wonder how many bathrooms are there in the family deluxe (4 pax). Cause I think one toilet is a little uncomfortable for us. As we will be staying in Halong Bay, would you still provide a free shuttle from our guesthouse? Hi there, We are three people and our hotel is Heart Hotel (11B Hang Hanh Street, Hoan Kiem District, Hanoi). Is our hotel within your pick-up service provided area? Also, I'm wondering if the cost includes Halong entrance fee surcharge (If it does not, I need to reconsider making this booking). I look forward to hearing form you. Thank you. I'm looking for a cruise that stops at one of the fishing villages--preferably Cua Van. Does this cruise do that, or could you recommend one that does? Hi, can Deluxe cabin used for 2 adults and a 15-year teen? How to calculate the fee? Is it include all costs? Thanks. Hi My husband and I are looking at going on the 2 days 1 night cruise on July 29th. We are wanting to see if we can take the shuttle bus the day before and stay a day in Halong bay the day before and head back to Hanoi after the cruise. Is that possible? Dear Ms. Jennifer Johnson, Thank you for contacting us and we can surely arrange you to take the shuttle bus the day before. However please prepare to get to the pier yourself on the 29th as we cannot pick up in Halong Bay area! If you have any other question please let me know! Hi, may i know if you do pick up from little hanoi deluxe hotel? Is it possible to pick up from / to Hanoi Hoa Duong Hostel (01 Hang Mam Street,Hoan Kiem District, Hoan Kiem, Hanoi, , Vietnam)?. Thanks. YH Lee. Hello there, Just wondering on a couple things. The Free shuttle will pick up from any hotel in old quarter? On the way back to Hanoi would it be possible to get dropped off at the airport? or do we have to go back to the hotel we were picked up at? Where do we get dropped off? And are the rooms quiet? or can you hear generators and such? Thank you! Dear Mr. Chris, Many thanks for your question. Glory cruise bus can surely pick up from Skylark hotel, pick up time is between 7:30am and 7:45am. If you have any questions please let me know! Hi, me and my friend are very interested in your cruise! But we have one questions, we come in 5person/pac. We are about to order a room with 2person + 1person. Is adult can be considered as 2+1 or we need extra bed charges ? Hello, we are a family of 5 (but young kids of 5,7,8). Our we permitted to stay in the family room of 4 as our youngest will happily share our bed and we prefer to be in one room with them all being so little. Hello! My family and I are looking at booking a Ha Long Bay cruise in early July. (Two teenagers and two adults.) We are thinking of booking two seperate Glory Suites, would it be possible to book them next door to each other? Thanks! Hi we are looking at booking the family suite / Glory legend for 2 adults + 2 teenagers for 16th July 2d / 1n 1. is this 2 rooms, with 1 x double + 2 x twin? 2. we will be getting the train from Hue arriving 05:30am. What do you recommend for pickup / transfer (we will be pretty tired)? hello I am interested in booking a cruise with you guys! I will be arriving to Hanoi around may 22 at night time! Should I book a hotel near the old quarters to spend the night and then book a cruise with you guys the next day for the shuttle pick up? Also on that next day, should i check out of the hotel and take all the luggage I have with me onto the cruise. I will be having a large suitcase and a carry on and I don't know if that is appropriate to bring on the cruise or where to put that. Thank you. Dear Ms. Christle, Thank you very much for your question. We are sorry that the bus can only pick you up from Hanoi Old Quarter. Therefore you can take a taxi from the airport to our office (latest pick up is at 8:00am) for boarding the shuttle bus. For hotel recommendation, you can consider Hanoi Morgans Hotel or Church Boutique Hotel or Oriental Suites hotel. All of them are high quality for reasonable price. If you have any other questions please feel free to let me know! I want a reservation for 5 people on may 5. Can I get a shuttle near Hanoi University? Does the cruise include WiFi? Hi, just wondering can I stay at any hotel in Hanoi? Is there any particular place that I have to stay in order to take shuttle bus? Hello there, i'm interested in the 3days tour in march, however, I see in the itinerary that we are due to arrive back to Hanoi 4:30pm. How accurate is this timing? as I would arrange for a flight that same evening. Hi, i just have a question about the bus shuttle that take us from hanoi to halong and back, does it has a bathroom? thanks! Hi, Is it possible to bring our suitcases and be picked up at our hotel in Hanoi and after the 3 day cruise be brought to Ninh Binh? Thanks! Good day, just like to check if the Somerset Grand Hanoi (No 49 Hai Ba Trung Street) is inside one of the pick up hotels for the shuttle service to Halong bay? Hello it is my first time travelling to vietnam, so I do not know where is the old quarter. The hotel we reserved is Hotel Emerald Waters in Hanoi(47 Lò Sũ, Lý Thái Tổ, Hoàn Kiếm, Hà Nội). do you provide a pick up service? Dear Ms. Victoria, Thank you for contacting us and yes, we can arrange different food for you thus please no worries about it. Instead of seafood we can prepare meat or chicken as alternative. If you have any other questions please let me know! Dear Mr. Thomas, Many thanks for contacting us with your question. We can pick you up from any hotels in Hanoi Old Quarter, included Meracus Hotel as you mentioned. If you have any questions please let us know! Dear Kelsy, Thank you very much for contacting us. It's great to know that you choose Glory Legend for your trip. The visit to Titov Island is included for both 2 day and 3 day trip on Glory Cruise. If you have any other questions please let me know! Hello, I'm thinking of trip with my nephew on Nov.20-21. My nephew's birthday is Nov.16 and he becomes 5 year old. So, if I want to book the cruise on Nov.20-21, I have to charge 75% of adult fare for my nephew, am I right? Hi, I am interested in Halong Bay Cruise. May I check with you how long in advance do I need to make the booking if I would like to travel in December? Thank you. Hi, I am just wondering if we can be pick up in the Hanoi airport? we will be arriving at 5:00 am, if you, can is there additional charge for that pick up ? Hello~! I am just wondering that you have any insurance for guest and your cruise hotel? because there are no mention on the website. By the way other cruise hotels are mention it. Another question is, is it possible to drop off another location hotel instead picked up hotel first because we are going to stay another hotel after get back Ha Long bay tour. But it would be also near by Hoan Kiem lake. is there any extra charge if I do this? Hi Chantal, Thank you very much for contacting us and I understand that weather is a cause for concern for visitors to Halong Bay. Please see our policy on cancellation due to bad weather below: 1/ If the tour is cancelled in advance with prior notice, full refund will be made. 2/ If the tour is cancelled midway through, you will be charged for service already use (such as shortened cruise trip, or breakfast, or shuttle bus, whichever applies in specific case). I hope this information addresses well your question. Please feel free to let me know if you have any other questions please let me know! All the tour informations (not just this one) say that the tours end around 4pm or 5pm at Hanoi. Can I rely on this information? I plan to take flight at the evening (around 8pm or 9pm) to Da Nang and I don't want to miss the flight or be in big rush. Dear Ilona, Thank you so much for your email and our bus will return to Hanoi Center at around 04.30 - 05.00PM thus it is alright for you to take the flight at around 08.00 - 09.00PM. No worries. hi.. we're on group..10 person.. our flight arrive on hanoi 8.30 am.. so it's possible for we to join the same day 2 daytour and pickup at the airport?? Dear Sumiati, Thank you for your email. As your plane arrives at 8:30am, it will took another 30-60 minutes to complete all the procedures such as luggage collection and if arriving from another country, you need to clear customs too. I am afraid you cannot make it for the cruise trip that day. Therefore, I recommend you to go to Hanoi for an overnight stay and leave for the cruise the next morning. If you have any questions please let me know! Hi, do you have an option for a shuttle transfer from Hai Phong or do all transfers take place from Hanoi? Hi, Just wondering if there’s any other food available apart from seafood, As of allergies. Dear Jake, Thank you for contacting us! We can surely prepare special food based on your preference. Non-seafood menu is available during our meals too. If you have any other questions please let me know! Dear Jasna, Thank you very much for contacting us and please kindly find my answer to your question below: 1/ December is the best time to visit Halong Bay, especially the first half of the month when it's not too cold and there are fewer tourists 2/ The price is $125/person or $250/ for 2 persons, including round trip transfer by shuttle bus 3/ From Hoi An, please go to Danang and fly to Hanoi. Then it's 3.5 hour bus trip from Hanoi downtown to Halong Bay. If you have any other questions please let us know! Hi, Does the journey back drop us back to hotel if staying at Hanoi Hibiscus Hotel? Dear Cecilia, Thank you for contacting us! Our shuttle bus can pick up and drop off at the hotel you mentioned for sure. If you have any questions please let me know! Dear Jungmi, Thank you for your question! Our shuttle bus can only pick up and drop off at hotel in Hanoi Old Quarter which is 40 minutes from the airport. You can get a taxi to our office at 7:30am to be picked up. I hope that helps! hi, do your cabins offer air conditioning? also, does your itinerary cover most of the must-go places along halong bay? thanks! Hello, Does the journey back drop us off back at our hotel? Or in the city centre? Dear Nicole, Thank you for contacting us! The shuttle bus can drop you off at your hotel, if it's in Hanoi Old Quarter area. Drop off time is around 4:30-5:00pm. If you have any questions please let me know! HI! Can i use two double beds in family suit for 4 peoples? I want to make a reservation for 4 adults, so do you have any recommendation? Dear Suhyeon, Many thanks for contacting us. We can surely arrange you 2 double bed in the family suite. Glory Legend's family suite is an ideal choice for family with 4 adults. If you have any other questions please let us know! I'd like to book the family suite (3pax) for 3 adults, but I can only select maximum 2 adults for one room. Please let me know 3 adults for one room. Dear Bomi, Thank you for your question about Glory Legend cruise! You can now select the room with 3 adults and our website will show several options (either a room combination or family suite for 3 adults). I hope this helps! I am a bit confuse with description in price for family suites. is it 480 USD for 4 pax or 2 pax? Dear Wicac, Thank you for your question and I am sorry about the confusion you may have. We have 2 types of family cabins, for 3 adults ($400) and for 4 adults ($480). The price is for 3 adults and for 4 adults respectively. If you are 2 adults and wanting to take a family room, the charge of $400 still applies as it is the minimum charge. I hope this information is helpful for you! Hi, I understand that 3 person can stay in a deluxe cabin. Can I know how much does the 3rd person cost for the deluxe cabin? Thanks! Hi, Since the Family Suite (3 pax) comes with 1 double bed and 2 single beds, does that mean, with an extra mattress, it can room 5 adults? Is USD 690 for 1 of these suites, 3D2N? Dear YS, Thank you for your email! We have 2 rates: family deluxe for 3 persons and family deluxe for 4 persons. If you want to stay 5 adults in one family suite, the cost will be cost of 4 adult + 1 extra mattress. The cost is $890 + 200 = $1090, including round trip transfer by shuttle bus. If you have any other questions please let us know! Hi, Does the deluxe cabin come with a balcony? Can 3 adults stay in 1 cabin? Is kayaking included in the 2 day 1 night trip? Hi John! Kayaking is included for both 2 day and 3 day itinerary of Glory Cruise. There is no extra fee for this activity. Hi, does deluxe cabin on Glory Legend Cruise has a balcony? Hi Helen, Thanks for your question. On Glory Legend Cruise, only suites cabin have private balcony. Deluxe cabins do not have a balcony but come with big window for seaview. All crews were excellent and tried very hard to make me happy. I really enjoyed the friendly atmosphere. The food was abit bland, need more spice. Everything was great. All the crew provided good service. For the dinner, we thing it's more suitable for the fish to be served first because when we ate all other dishes, we already full and hard for me to finish the fish. What I like most about the trip is the peace and quiet. I like that only wifi on top deck. It's nice to have a break from technology. All staffs were very nice, the room was beautiful and spacious, beds are very comfortable. However, drinks were very expensive even in happy hour. We would have bought more if they are cheeper. It was nice to have such a humorous guide like Lee with us. The cabin, the staff, food ect... was amazing. Fantastic trip!